really crazy at the beginning trying to keep track of how 20 five year olds are going home! RIT dyed clothes pins!!!! What a great idea!!! I could use these for all sorts of things in my classroom! 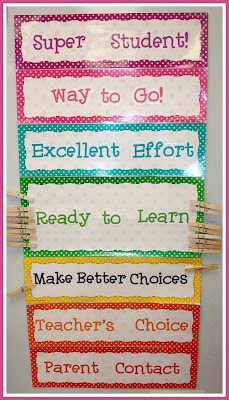 I love this chart to track behavior within the classroom. This hold everyone accountable and gives everyone a chance to grow! Okay, I am sure I could continue to share more favorite ideas, but you would be here a long time! So I am going to start with these! I really think I will be incorporating a few of these ideas into my classroom this year! I used the "going home" clip chart last year. I almost think it was a waste of my time to make it. It may not be for kindergarten though. I also used the behavior "clip chart." I LOVED it. It was the most effective behavior system that I used. The kids were SO motivated by the chart. I gave 1 ticket if they were on purple (2nd from top) and 2 tickets at the end of the day for those on the top. At the end of the week, I drew 5-10 tickets and those students got to pick a prize from the treasure box. It worked like a charm most of the time. Hi, I am one of your newest followers and I have nominated you for an award. 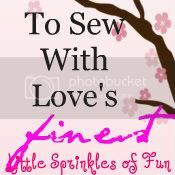 You can check it out at Fun and Learning in First. What an awesome idea. I think I may do something like this for my sunday school class! Thank You!